Every so often you meet a musician with whom you fully connect, something akin to a soul convergence, if you will. One such instance, for me, occurred when I connected with Allen Hart. Our first meeting was in July 1983 at The Festival of American Fiddle Tunes in Port Townsend, Washington, when Tom Sauber and Allen had brought Eddie Lowe up from the Los Angeles area to teach at Fiddle Tunes and I was out from Ohio. A year later, Allen and I had each moved to Seattle. We were reintroduced by mutual friends and our musical partnership, and personal friendship, ensued. Sometimes I felt like we were reading each other's minds, but what really happened is much more complex; we shared aesthetics, listened to a lot of the same source material, studied the histories, but most of all, we listened to each other. Several more years passed, however, before I began to discover and appreciate the breadth and depth of Allen's banjo expertise. He'd asked me to accompany him in a banjo styles presentation at Fiddle Tunes. Then, for the first time, I heard him play classical banjo, minstrel-era stroke style, and ragtime, among other even more arcane styles. I realized soon after that this was only the tip of the proverbial iceberg. Our visits with Matokie Slaughter and Bertie Mae Dickens provided some new directions, and reacquainting with Stu Jamieson solidified others. When my interest in African-American old-time fiddling developed, I found that Allen had been immersed in African-American banjo styles, often even studying the historical banjo partner to the fiddler I was trying to emulate. I won't try to describe Allen's journey in learning and developing his banjo playing, for he does that much better than I. I have greatly enjoyed my ride with Allen and hope to do more into the future. I was elated to learn that he had (finally!!) decided to embark on the creation of his own banjo CD, and honored to have a role (this blurb). Now, so many more people will learn what I have known for more than two decades and come to appreciate what Allen does. At this point, all I can add is to tell you to sit back, relax, and enjoy... Kerry Blech, Bainesville, Florida, March, 2006. 1. DAVENPORT [Key of F: banjo - fCFCD] I learned this tune in the 1970s while attending college in Los Angeles. From the age of seven through the age of nineteen, I had played in a style which my dad, Lewis Hart, had taught me. This style involved "up-picking" the melody with the index finger on strings 1, 2, and 3, and using the thumb for the 5th string, and sometimes the 4th and 3rd strings depending on the tune, and then down brushing with the index finger again. It was about 1968 when I met a fella who told me that I wasn't playing the banjo correctly, "...you are supposed to be frailing down with the back of your hand, like this" he said. I'd seen clawhammer before but imagine my surprise when I bought this new album that had just come out of Dock Boggs Vol. 3 (Asch Recordings 1970), recorded and edited by Mike Seeger. Here was Dock Boggs playing in a similar style as mine, but incorporating his second finger picking on the first string while his index finger brushed down. I'm indebted to Mike Seeger for his efforts and those recordings of Dock which had such an influence of my banjo playing. I did however go on and learn the "knock-down" and other styles. Dock learned this tune at a young age from his older brother John Boggs in the early 1900's. I'm playing a banjo that was made by Okie Adams. Okie's philosophy in making banjos is "...the heavier the banjo the better it sounds." I bought this one from him in 1969; at that time his heavy banjos were 20 pounds, however in later years some of his banjos went up to 50 pounds. I consider myself lucky not to have met him in his 50-pound phase. Anyway, it seems like the older I get the heavier this banjo gets, but boy, it sure does sound good. 2. MARCHING THROUGH GEORGIA [Key of G: banjo gDGBD] I met Clyde Troxel (1911 - 1994, of Rocky Branch, KY) at the Festival of American Fiddle Tunes in Port Townsend, Washington. He was there with his brother Ralph. Clyde was about 80 years old at the time, and of all the banjo players I had met and learned from over the years, Clyde's style was almost a perfect match to the two-finger "up-pick" style I learned from my dad in the 1950's. His was strictly a two-finger up-picking style, picking up with the index finger playing melody line, brushing down with the index finger and then thumb on the 5th string. He was a treasure and a wonderful man. One of my favorite stories of his was of the family heirloom, the spit'n tobacco barrel of four generations that they kept over in the log house. Clyde can be heard with his brother Ralph on Marimac cassette tape 9025 - Troxsong - recorded in 1990. The banjo I use for this tune is a 1904 Whyte Laydie #7 made by the A. C. Fairbanks & Co., Boston. The banjo is smaller than usual with a 10-inch pot and 25-inch scale. I have owned this banjo for about 27 years. 3. CHILLY WINDS [Key of A: banjo - aEAC#E] with bones. Wade Ward's playing of this tune sucked me into the blooming folk revival with full force. Wade, with his fast, clean and inspirational banjo picking in the clawhammer style set the tone for me for many years. I learned Wade's Chilly Winds from a home recording, but Wade can be heard playing this tune on County 535, Round the Heart of Old Galax, Volume 3. Playing the bones with me on this tune is Clif Ervin, known throughout the world as the "Ambassador of the Bones." I play the Whyte Laydie #7 banjo on this tune. 4. COO COO BIRD [Key of D, Sawmill Tuning tuned down 5 steps from G - dADGA] I learned the "Coo Coo Bird" from Clarence Ashley's playing. My dad took me to see Clarence Ashley and numerous others at the Ash Grove in Los Angeles in the early 1960's, as this was one of his favorite hangouts. After learning the tune in Clarence Ashley's clawhammer style and playing it that way for many years, I fell into this version using a two-finger picking style to try to mimic the clawhammer sound of his banjo playing. In this style I alternate the melody line or lead between the index finger and thumb. I'm playing one of the banjos I build and sell, a reproduction of the Williams E. Boucher Jr. banjo (circa 1845) that is housed in the Smithsonian Institute. W. E. Boucher Jr. (1822 - 1899) was an antebellum banjo maker in Baltimore, Maryland around the mid 1840's. I make two versions of his banjos. The banjo of this tune has two heads, one on the front and one in back, and has a unique sound. It is strung with gut strings and has no frets. 5. WILL DAVENPORT'S TUNE [Key of F: banjo - gFGCD] When Clyde Davenport taught me this tune he said he learned it from his father, Will Davenport, a Kentucky fiddler. Since there is no name for the tune that Clyde could remember, Kerry Blech and I adopted the name from Clyde's father. We can be heard playing Will Davenport's Tune on The Young Fogies, Volume II (Rounder Records) and with Sheila Blech on Devil of a Row (Swing Cat Records). I am playing the tune in the clawhammer style and using the Whyte Laydie #7 banjo tuned to this wonderful tuning. 6. "...NOW FOLKS, I'M GOING TO GIVE YOU THE GENTEEL" [Key of C: banjo - gCGCD] Says Uncle Dave Macon before he jumps into the tune with a loud brush roll to get our attention. He starts off many of his tunes or stories with a short instrumental piece, usually picked. "The Genteel" precedes the song "Shout Mona, Shall be Free" on the reissue album called The Dixie Dewdrop (Vetco Records). It can also be heard on the reissue CD set Keep My Skillet Good and Greasy, Bear Family 15978. I equate this tune with "Rochester Schottische," as it sounds very similar. Uncle Dave is using an old time three-finger picking style with great drive that I try to mimic. I started learning this tune and Uncle Dave's stylistic approach in 1978 and of course I'm still trying. I play this tune on my wife's 1890s Cole's Eclipse banjo strung with nylon strings. 7. TILDEN [Key of D: banjo - f#DF#AD] I first heard this banjo tune while the band that I was in, The True and Trembling String Band, was playing at the San Diego Folk Festival. Hank Bradley, who as of a few years back reached the level and distinction of an old geezer, wrote Tilden in 1968 to play in the 35th Annual Berkeley Fiddler's Convention. I'm not sure if the tune garnered enough accolades to win the contest, but it sure is a good banjo tune in the clawhammer style. I am playing the #7 Whyte Laydie banjo. 8. CLEVELAND'S MARCH TO THE WHITE HOUSE [Key of G: banjo - gDGBD] In 1988 while my friend and I were taking a Dramamine tour through Virginia and the North Carolina regions, we were invited to attend a recording session of Bertie Mae Dickens (1902 - 1994). She was a two-finger banjo picker living just outside the Virginia line in Ennice, North Carolina. Wayne Martin was recording Bertie for the North Carolina Arts Council at her home. She said that she learned this tune from her brother, and it seems to have been a regional favorite. 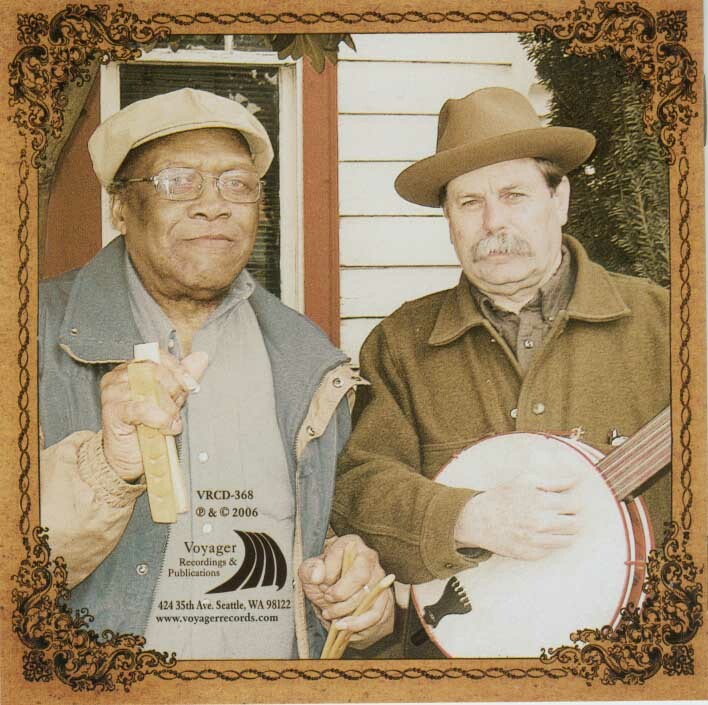 Wayne's recording of Bertie Mae playing this tune can be heard on Rounder CD 439/440 The North Carolina Banjo Collection. The tune refers to the presidential campaigns of Grover Cleveland, who won the presidency twice - but not consecutively - in 1885 - 1889 and in 1893 - 1897. I'm playing the #7 Fairbanks Whyte Ladie banjo. 9. PEACH BOTTOM CREEK [Key of F: banjo - f#DF#AD] with bones. Also known as "Wade's Special" and composed by Wade for the name of the area where he lived. This tune is in the clawhammer style. I play my Okie Adams banjo and have the "Ambassador of the Bones" backing me up. 10. PRETTY POLLY [Key of D, Sawmill Tuning down 5 steps from G - dADGA] "Pretty Polly" here is influenced more by Virgil Anderson's style than anyone else's, but it is truly my version of this traditional tune. I play the two-finger style here with thumb lead on my reproduction 1845 Boucher banjo. 11. COAL CREEK MARCH [Key of G - gDGBD] I learned this tune from the playing of Dock Boggs. Dock can be heard playing it on the Smithsonian Folkways CD, Dock Boggs, His Folkways Years 1963 - 1968. According to Pete Steele, back in Coal Creek, Tennessee, 1400 miners got caught in an explosion of the Coal Creek mine and perished. When rescuers finally brought the miners out, none of the wives or family members could recognize their loved ones as they were so burnt. I play this tune on my #7 Whytet Laydie. 12. HOLLY DING [Key of D - aDADE] This is a banjo solo in the clawhammer style I learned from Wade Ward of Independence, Virginia. Tommy Jarrell pointed out that this family of melodies is known as "Holly Ding" above the mountain, the Blue Ridge chain separating North Carolina and Virginia, and as "Back Step Cindy" below the mountain. I am playing my #7 Whyte Laydie. 13. LAST CHANCE [key of F - gFGCD] I learned "Last Chance" from my dad many years ago in the two-finger up-picking style. This version is clawhammer and in a slightly different tuning than what is called the "Last Chance Tuning" of fCFCD. I'm playing the Okie Adams banjo on this tune. 14. ALABAMA GALS [`Key of G - gDGBD] I learned this clawhammer tune from Sidna Myers of Hillsville, Virginia who is featured on the album High Atmosphere - Ballads and Banjo tunes from Virginia and North Carolina, collected by John Cohen in November 0f 1965 by Rounder Records. I took to his playing and this tune right off as it has such as different sound from the first part to the second. In the first part of the tune he notes and frets the fifth string with the thumb, which is unusual. I am playing the Okie Adams banjo. 15. SCHOTTISCHE TIME [Key of D: ADADE] From Dock Boggs. Dock said he learned this tune from Jim Begley of Tennessee over some whiskey in Dorchester, Virginia. It's a beautiful tune played in the two- and three-finger picking style. I'm playing the 1890s Cole's Eclipse on this tune. 16. ALTAMONT [Key of C: banjo - gCGCD] with bones. For many years I've been acquainted with Gloria and Stu Jamieson and we have become good friends and fellow banjo enthusiasts. Stu, in 1946, along with Margot Mayo and Freyda Simon, and in 1949 with his wife Gloria, recorded an African-American string band consisting of John Lusk - fiddle; Murph Gribble - banjo; and Albert York - guitar. It was said that this band was one of the best square dance bands around in south-central Tennessee. These recordings can be found on the Rounder Records CD 0238 Altamont: Black Stringband Music. The tracks of LG&Y on the Rounder CD are taken from the 1946 and 1949 recordings session. Back in the 1980s I spent some time with Stu trying to grasp Gribble's banjo playing. Gribble's playing is something like a syncopated three-finger banjo style played at or around the tune; the playing is free and not confined to rolls or patterns. Gribble referred to his tempo and style as a "broke-legged" rhythm and attributed it to older musicians he had learned from around the area. I play this tune in the more modern tuning, in the key of C from Gribble's A tuned down one and one half tones to eAEAB. Antebellum banjoists also tuned their instruments lower than what is standard pitch today. The Ambassador is accompanying me on the bones and I'm playing my #7 Whyte Laydie banjo. By the way, Stu tells me that Gribble, having seen Stu's #7 Whyte Laydie banjo, wanted to play it for the recording sessions and did. 17. THE COO COO BIRD [Key of D, Sawmill Tuning, tuned down 5 steps from G - dADGA] This version of "The Coo Coo Bird" was influenced by two excellent banjoists who played it in the clawhammer style, Dink Roberts and Clarence Ashley. Dink Roberts (1894 - 1989) was an African American banjo player from North Carolina who can be heard playing "Coo Coo Bird" on Smithsonian Folkways Black Banjo Songsters of North Carolina and Virginia. I'm incorporating Dink's coo coo call into Clarence's second port of "The Coo Coo Bird;" this results in a very interesting and dynamic piece. Clarence Ashley can be heard playing his version on Folkways Records 2359 Old Time Music at Clarence Ashley's. I'm playing the 1845 double-headed, fretless Boucher repro for this tune. 18. JOSH THOMAS' ROUSTABOUT [Key of C: banjo - gDGBD] with bones. I was given a set of CDs recorded by Cliff Edress in 1970, in Hollins, Virginia by my friend Kerry Blech. What a treasure set of recordings by African American player Josh Thomas there three hours of recordings are and I want to thank Cliff for making them available. Josh's clawhammer style on Roustabout is unique and creates a wonderful drone by alternating back and forth on the fifth and third strings. Clif Ervin is accompanying me on the bones and I'm playing the Okie Adams 20-pounder on this tune. 19. FRENCH WALTZ [Key of C: banjo - aCGCD] I learned this tune from Clyde Troxell and it is one of my favorite tunes. Playing this tune includes the two-finger up pick plus a brushing in the second part that falls within the motion of the up-pick. The tune was quite popular at one point in Clyde's area and was played by his banjo-picking peers such as W. I. Gregory and Virgil Anderson. I am playing my #7 Whyte Ladie banjo. 20. GOODBYE OLD BOOZE [Key of G: banjo - gDGBD] I learned this tune from Art Rosenbaum playing on the album Folk Banjo Styles by Electra Records, NY. As did Art, I'm using Pete Steele's two-finger up-pick style which gives this tune great drive. I'm playing the 1890s Cole's Eclipse banjo. Design by LYNCH GRAPHICS, INC., Asheville, NC. Special thanks to my wife DEBBIE SPIEGELMAN for her love, encouragement, photography, and editing. I ALSO WISH TO THANK: Kerry Blech for historical references and kind words, Jim Bollman for the 1877 Dobson tutorial cover art, Phil and Vivian Williams, David Lynch, Mike Seeger, Clif & Eric Ervin, Bobby Fulcher, Stu & Gloria Jamieson, Lewis & Joy Hart, Arlo Hart, Sam Hart, Dan Spiegelman, Hank Bradley, John & Susan Burke, and to all those wonderful people that shared their music.